I have been knitting. I'll show you later. 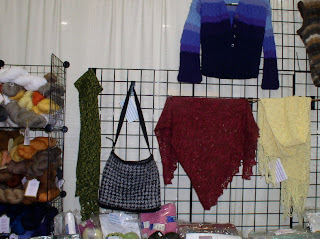 Last week end I was teaching crochet for knitters at Knitter's Fantasy in Youngstown, Ohio. This is a new location for this event, but it seemed to work well. The even had outgrown the previous location and this one has more room. I taught the same class twice. I need to work on it some more to expand it to 3 hours. I have until TKGA in September. 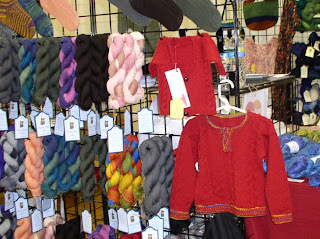 I had 3 designs on display in the market. All of them are for Oasis Yarns. The green scarf is crocheted from their Seduction Silk. I called it Spring Garden. The red shawl is also from Seduction. It is knit.That stuff is wonderful! I called it Queen's Lace. I just found out that you can click on the pictures to make them bigger. Here's the Snakes and Snails sweater in the wild. It's shown with Aussi Sock. That's the yarn it's knit from. 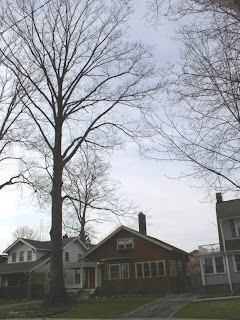 Trees in my neighborhood looked like this oak tree - lacy, but bare. 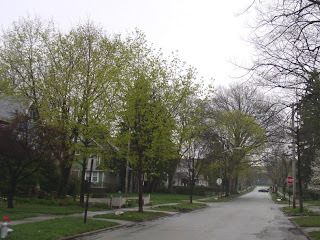 Today, there are trees with green lace. 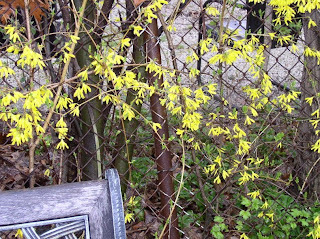 Forsythia is in bloom, grass has turned green. DH calls it "that ugly shade of green" that means mowing is required. 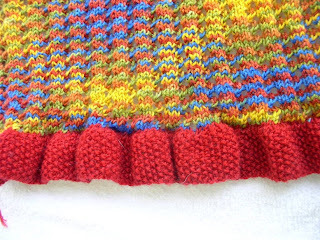 I've been knitting on the girl sweater from Aussi sock. Both sweaters have a TNNA deadline of June 6. I'm on the last sleeve of Sugar and Spice. But still have the neckband to do. I'm not sure how I will attach it. The ruffle will also go around the neck. I'll put a life line on it, so if I don't like the attachment I can retreat. These are the same yarns as Snakes and Snails.